Ladies! It’s time to earn/learn your independence on the bike! Too many women feel uncomfortable riding on their own or leading rides because they feel they don’t know how to take care of their bike if something goes wrong. 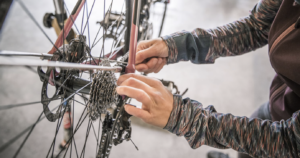 In this 2-hour workshop, you’ll learn how to change a flat, how to make minor adjustments (derailleurs and brakes), and how to clean your bike. We’ll have time for questions, too!